On October 15, 1914, an unprotected cruiser, the German gunboat Geier, entered Honolulu Harbor. Under neutrality regulations, a warship could remain in Honolulu’s port for 24 hours. However, the ship’s captain was granted three weeks in port to attend to repairs of the boilers and machinery. On the morning of October 21, a Japanese battleship, the Hizen, patroled the seas just outside the three-mile safety zone off the coast. It patrolled until November 7th, when the repaired ship was interned in Honolulu rather than taking to sea to battle the waiting Japanese ships. The internments of the Geier and another German ship, the Locksun, were used by Germany to show that the U.S. favored the Allies. On January 31, 1917, Germany withdrew its previous policy by announcing its submarines would sink all ships including those from neutral countries within the previously safe zone off the coasts of Great Britain, France, Italy and the eastern Mediterranean. On Feb 3, 1917, the U.S. Ambassador was recalled from Germany and diplomatic relations between the two countries were broken. These international events were being played out in Honolulu. 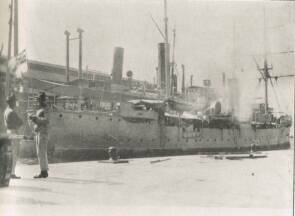 Beginning on January 31, smoke rose from the funnels of the interned German ship Geier. On the morning of February 4, the smoke continued to rise from its decks, but the crew refused to extinguish or allow others to extinguish the fire. Captain George Clark of the U.S. 14th Naval District boarded the vessel and after a conference received the surrender of the ship from its Captain. The crew was interned at the immigration station until Washington D.C. ordered them to be released and the custody of the ship returned. On April 5, the U.S. finally took possession of the German ships, interning their crews once again at the immigration station. After months of anxiety of having enemy ships so close to the civilian center of the territory, the takeover was long overdue. The Geier was recommissioned as a U.S. Navy ship and renamed after Carl Schurz, a German-born immigrant who became a distinguished American citizen, Secretary of the Interior and war veteran. Several Hawaii-born sailors served on the Carl Schurz which sailed to the Atlantic in late 1917. On June 18, 1918, while patrolling off the coast of North Carolina, the Carl Schurz collided with the steamer Florida. The U.S. ship that was once interned in Honolulu sank taking with her a son of Hawaii: Manuel Gouveia, Jr. The Geier was recommissioned as a U.S. Navy ship and renamed after Carl Schurz. Schurz was a German-born immigrant who became a distinguished American citizen, Secretary of the Interior and war veteran.